Fantasia Del C — Origin P.R.E. In 2011, Fantasia was awarded the highest morphology score of the show under Spanish judges every single time she was presented. She also earned a Gold Medal Best Movement award under every Spanish Judge. 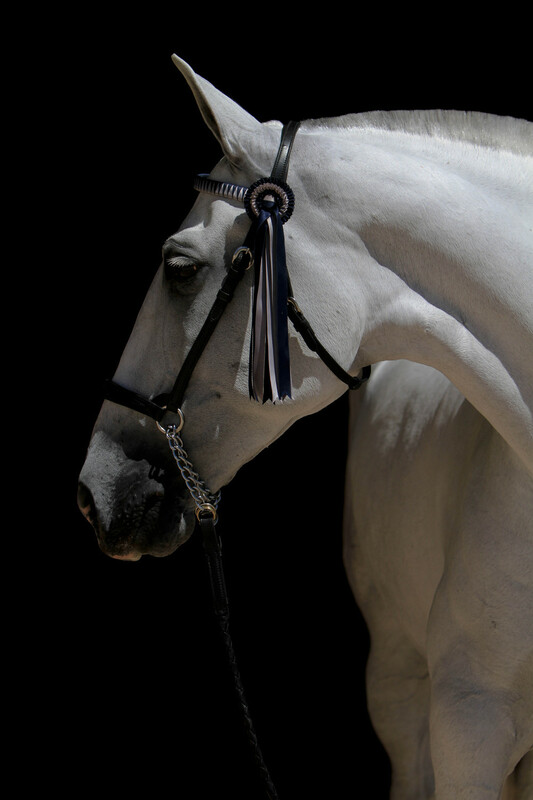 Fantasia Del C is a 2004 grey Pura Raza Española mare sired by Revoltoso XIV, and out of Gozosa II. Fantasia’s sire Revoltoso XIV is the sire of multiple Gold Medal Best Movement award winners and multiple Champions alike. Fantasia’s dam Gozosa II, a Gold Medal Best Movement mare and Foundation Certificate of Merit horse herself, earned the title of Campeona De La Raza on two separate occasions, one of them earning her the title of 2002 National Celebration Champion P.R.E. Mare. Fantasia is Qualified (Reproductor Calificado) with ANCCE and PRE Mundial, and registered with the IALHA. Fantasia's foals will be also eligible for registration with all three entities. Fantasia produced a gorgeous grey filly named Venecia SCS by the Cardenas stallion Genil-MAC in 2009, and an incredibly athletic grey filly named Gozosa SCS by the bay Qualified stallion Dominante XXIX in 2012. Fantasia's offspring will be available via Embryo Transfer only so that she can continue with her dressage and performance career. Contact us if you are interested in purchasing an embryo.